A young woman returns home one year after losing her hands in a savage attack. She cannot remember who her assailant was, but a trip to the local post office leads her towards the truth. A reporter witnesses a brutal murder and becomes entangled in a mystery involving a pair of Siamese twins who were separated at birth, one of them forced to live under the eye of a watchful, controlling psychiatrist. A sad and depressing experience. 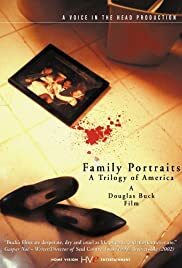 The first short "Cutting Moments"(1997)simply blew me away.It's an incredibly depressing and cold journey into into family alienation,murder and masochistic self-mutilation.A young wife Sarah played convincingly by Nica Ray desperately wants to be loved,but her husband Gary Bettsworth has no remaining feelings for the woman,so he turns his jaded sexuality onto his son,whom he abuses.She dresses up in red to become more appealing to her husband(unsuccessfully)and after that Sarah horribly mutilates herself.She scrubs her lips bloody before cutting them off,the final act of utter desperation that encourages her husband to indulge into obscene act of feeling.A truly masterful short filled with despair and horrific gore.The second film "Home"(1998)plays almost like a remake of "Cutting Moments" and has similarly disturbing tone without relaying on excessive gore.We see another dysfunctional family living in their own private hell and that makes the climax more bleak and depressing. "Home" is not as good as "Cutting Moments",but it surely left me emotionally drained.The last film "Prologue"(2003)tells the story of a young teenage girl,who was brutally attacked and raped one year earlier.She emerges from the hospital in a wheelchair and arrives back home with her parents.Soon the emotional horror begins as a young woman decides to confront her attacker,a local artist called Benjamin Miller,who draws obscene sexual pictures of a young girls.Still "Prologue" seems to be the most optimistic film of the trilogy and I really recommend it.Douglas Buck is certainly one of the bravest directors around and I can easily say that I liked "Family Portraits".9 out of 10.